Food and beverages can be purchased on site. The venue boasts a number of restaurants – enjoy Mexican food at El Pasado Mexican Cantina, Hawaiian cuisine at Aloha Beach Rice Bowls, and specialties from the grill at Sunset Grille. Plus, don’t miss the Blue Moon Public House, which always gets you into the spirit of the event – please be prepared to prove you are over 21 if you plan to buy alcoholic beverages. It’s recommended that you pay with cash, though vendors do have facilities to accept credit cards. ATMs can be found beside the merchandise booths on the North and South Plazas. The USANA Amphitheatre caters to corporate events in the specially designed Toyota Corporate Pavilion. Impress your clients or staff in the comfort of a 200 seat private area, with catering and bar services on hand. 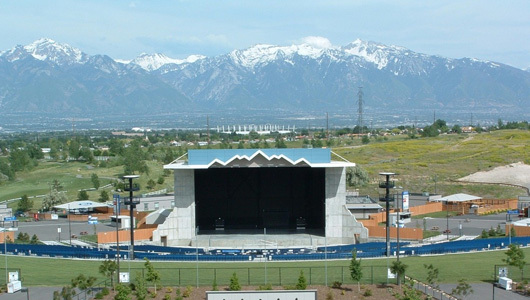 USANA Amphitheatre is not accessible via mass transport. Cab and limo companies in the area are familiar with the venue.